The idea of travelling to Thailand and disconnecting from reality for a week or two sounds enticing. But in today’s world staying connected is important to most of us, even if we are half way around the world. Having a smartphone with a data plan in Thailand has a lot of benefits. While you can use your home cell phone plan in Thailand, this usually requires buying an international data plan for a certain length of time. This can still be expensive (not as bad as roaming) and service can be spotty. Companies like T-Mobile offer free unlimited data, but it isn’t highspeed (more like 2G) and isn’t good for much other than an emergency. Your best bet is to get a Thai SIM card and data plan that you can use while you are staying in Thailand. Below we’ll walk you through everything from the basics, to how and where to buy one, and a number of other useful topics. What If My Phone Won’t Work In Thailand? In order for you mobile phone to work in Thailand it needs to meet the following criteria. I’ll expand on each one in further detail below. First, most modern smartphones are Quad-Band world phones such as the iPhone, Samsung S8, and Google Pixel. You can contact your cell phone provider if you aren’t sure if you’re phone will work around the globe. Global phone networks tend to run on different networks, bands, and frequencies. The U.S. works on different bands than Europe and Asia. Even within the United States, the four major phone companies are split between GSM and CDMA bands. Things get even more complicated when you add in 3G and 4G. To simplify things, phone manufacturers started making phones that would work around the world and on most any network. These are the World Phones. Once again, check with your provider if you are unsure if your phone will work in Thailand. Most cell phone providers lock phones if you are under contract or financing your phone. They do this to keep you from taking your phone to another company while it is still being subsidized or financed. If your phone is eligible to be unlocked, you will need to call or contact your mobile phone provider and request and unlock code. Once you have a code in hand, it is simple to enter the code and unlock your phone. If you can’t unlock your phone, then you won’t be able to use a Thai sim card. Some people will try and jailbreak their phones to unlock them, but it is risky and can lead to a ‘bricked’ or unusable device. Not something I’d recommend. With the advent of 4G most phones now have a SIM card slot. You’ll need a phone that can use a SIM card to get phone service in Thailand. This can get a little more complicated though if you don’t have a World Phone. Some providers have some phones that use the SIM card for 4G but fall back to in phone hardware for 3G/2G service. In the past, phones from companies like Sprint and Verizon couldn’t be used in Thailand because they only worked on CDMA networks, but handsets have come a long way. Once again, contact your home mobile phone provider before you leave if you have any questions. 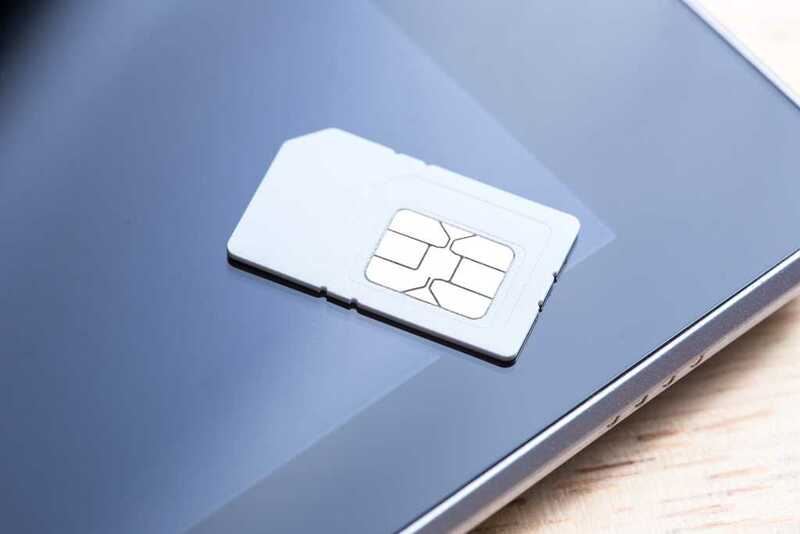 If you aren’t familiar with SIM cards, they are the small chips inside your phone that store your carrier information and allow you to connect to the network to make phone calls and data transfers. When you get a cell phone plan in Thailand, you will get a new SIM card to use while you are there, swapping it for your home carrier. So, what if your phone doesn’t meet one of the requirements to work in Thailand? You can buy a cheap, unlocked mobile phone on Amazon before you go. It won’t be as nice as a new iPhone or Samsung, but it will get you connected in Thailand. The other option is to buy a phone while in Thailand. If you are in Pattaya, the second floor of Tukcom has more mobile phones than you can imagine. You probably won’t get a better deal than you would back home, but you’ll know it will work. It is quite easy to get a Thai phone number and data plan. All you need is your phone, passport, and some baht. The best place to get a Thai SIM card is at one of the major mobile phone providers shops, I’ll cover where you can find them in detail in the next section. Here we’ll talk about the process so you know what you can expect. The shops will have a list of data plans that you can choose from. They’ll usually hand you a sheet, written in English, that you can select from. They usually also show you a selection SIM card packages that have the phone numbers written on the outside, if you want to select your own phone number. Once you make your selections, they’ll take your passport and your phone. The salesperson will install the SIM card, activate your phone, and take your cash. They’ll return your phone and your passport and you’ll be all set. Easy! Provided there isn’t a line at the counter, the process only takes about 15 minutes. A few years ago, the government passed a law requiring all foreigners to present their passport if they want to get a Thailand phone number. The phone number will then be registered to you. You can no longer buy a SIM card without presenting your passport. You used to be able to walk into any 7-11 or Family Mart and get a Thai phone number. Since the institution of the Passport requirement that is no longer the case. However, there are plenty of places to help you get setup with a mobile plan. You can buy a Thai SIM in the arrivals hall, after you clear customs, at Suvarnabhumi airport. The three major Thailand mobile phone companies have shops there (dtac, AIS, and True) . The lines can be long depending on how many people are arriving. The Thai cell phone companies usually have shops setup in most malls. If you are in one of the major tourist areas like Bangkok, Phuket, Chaing Mai, or Pattaya you shouldn’t have any trouble locating a shop. The easiest place I’ve found to get a SIM card in Pattaya is at Tukcom. They have both a dTac and AIS shop there. The lines are usually pretty short and I haven’t had any issues. There are other places like Big C Extra and if you must have a True Move plan, they have several shops in Pattaya as well. But Tukcom is super easy to find, and just head up to the second floor, the AIS shop is off to your right when you get off the escalator or the dtac shop is in the back corner, diagonally across from the escalators. 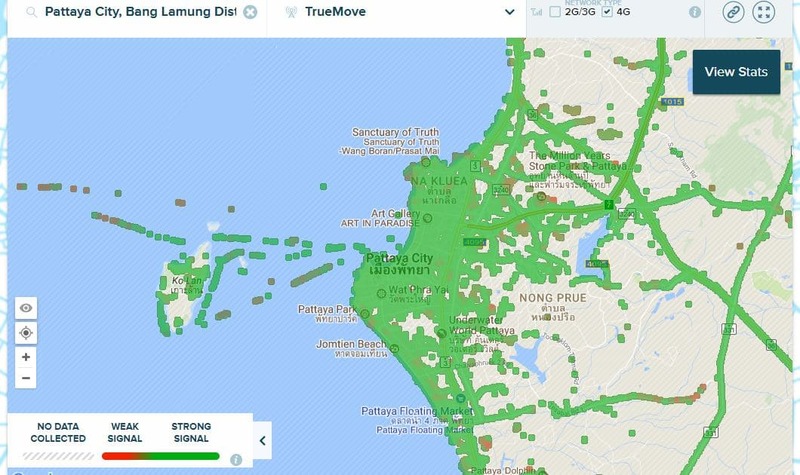 There are three major mobile networks in Thailand, dtac, AIS, and True. If you are in one of the major tourist areas they all provide comparable service and coverage in my experience. The plans are pretty competitive between providers. This comparison chart gives you an idea of the costs of a data plan on a Thailand prepaid SIM. Prices are current at time of writing, but could change at any time. These are ‘on-top’ packages that don’t include the base prepaid SIM prices that can vary. This is just to give you a rough idea of what it costs. *dtac also offers a 299 Baht (2.5 GB included 8 Days) plan. 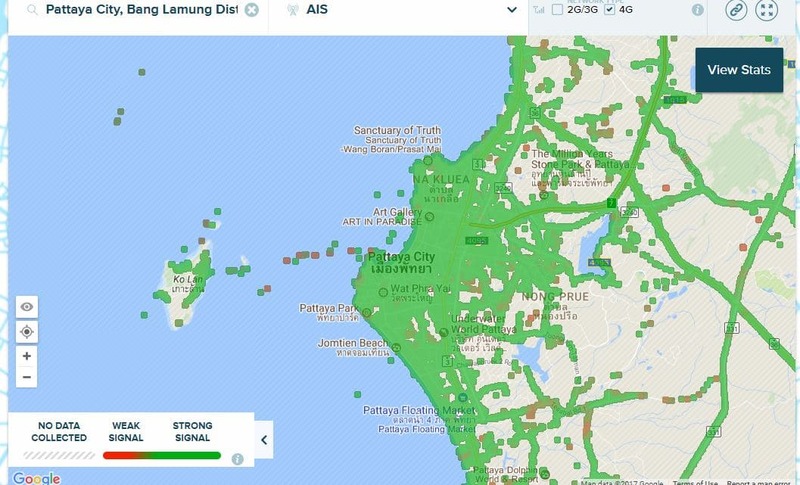 I’ve used the OpenSignal website to compare network coverage of the three main networks. Since this is on a Pattaya site, I’ve focused on this city. However, if you want to see national coverage or a different city you will be visiting, check out their website. As you can see in the following screen shots the 4G coverage in Pattaya is pretty comparable between AIS, dtac, and True Move. High speed data 4G LTE is readily available. Most of the Thai mobile phone companies offer some sort of Thailand SIM Card for tourists. They are usually valid for 1 or 2 weeks and give you both calls and data. The two big ones are the True Tourist SIM and the Happy Tourist SIM from dtac. Some traveler SIMs claim unlimited data for a week, but they cap 4G bandwidth. Some don’t allow top-up at 4GB speeds. You’ll need to ask questions and make sure you are getting what you need. 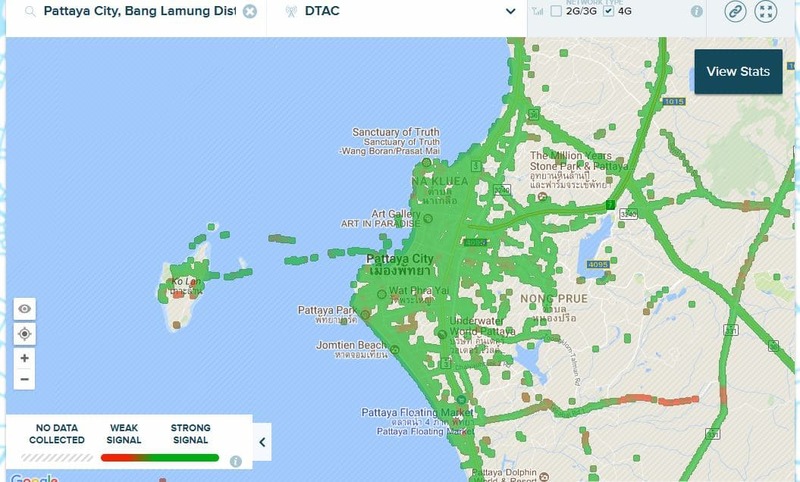 dtac’s plan is the most flexible I’ve found. You can by a cheap 49 baht SIM and then pick the data plan that best suits your needs. Wi-Fi can sometimes be spotty at hotels and guest houses in Thailand. If you have a big data plan you can use your mobile phone as a hotspot to connect to the internet. This can be a good option if you need to check email, browse the web, or do other functional tasks. It is not a good option for streaming movies as it can eat up your data plan very quickly. You can refill your Thailand mobile number at 7-11, your providers store, or their online website. To top up your cell phone at 7-11, you buy a certain amount of baht and they provide you with a receipt with a code on it. You then enter this code into your cell phone with the appropriate codes that determines what package you are buying/refilling. You’ll need to dig around your providers website to find the appropriate codes for you, which can be tough to find. Here’s a few links that might help you out. If this is all too confusing, a better bet is to head to your mobile phone providers store and have them help you refill it. There is no problem using any of the main messaging apps on a Thailand phone. You’ll find the most popular app in Thailand is Line. I rarely give out my phone number anymore and prefer to call and message on Line or Skype. Calling home internationally is free if the receiving person uses the app as well. If you don’t want to get a phone number and just need a data plan for your tablet or to use a mobile router, there are plans for that too. Just head to one of the mobile shops and tell them what you need.